Okay, this is weird. I’ve been using this Time Machine now for several years, as regular readers will know, and in that time I’ve never had any troubles. However lately… well, um, I’m not sure how to put this, but I think I’ve become stuck in 1975. Everything’s a bit hazy (as Time Travel will make it, just ask Shane Carruth) but I believe it began when Takashi burst from the Chronosphere outside my pad with a bag of grass and some incense. He was interested in the effects of operating a Para-Chrono-Discumbobulator under the influence of Acapulco Gold (it’s never really Acapulco Gold though, is it???) and I was in a bit of a mood for some Black Sabbath, so off we went to the magical year of 1975, June specifically. That was the month and the year that Black Sabbath’s masterpiece* Sabotage was released. Admittedly Sabotage has the power to be a time machine all by itself. The vast, cosmic scope of the record does nothing to undermine its moustachioed heaviness. In fact, it accentuates it. 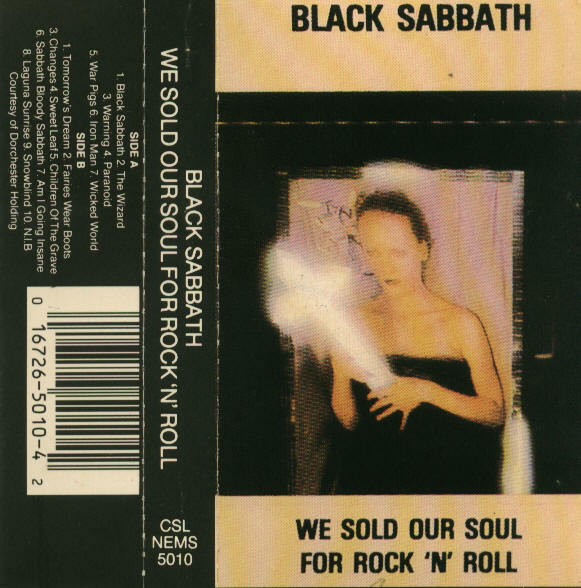 The fact that it’s one of the Sabbath albums that often escapes history’s attention adds to it a bit (not that greatest hits mean anything in my world, but from a marketing stand point the only offering from Sabotage to make Sabbath’s near-universally known anthology We Sold Our Souls For Rock and Roll** was ‘Am I Going Insane?‘ – as we will see this was no accident; the guys were doing what they wanted – high concept like – and Insane? is the only track on Sabotage that even remotely resembles something that would be radio-friendly in 1975, and even that probably barely so). The album begins with ‘Hole In The Sky‘. There is a rarin’, metaphysical drag to this song that puts you on an elevator toward the sky, only partly because the refrain is Ozzy asking the hole in the sky to take him to Heaven – seemingly not a redemptive heaven, but a place far away from the confines and limitations of this paltry, physical Universe. The song wedges its foot in the listener’s door but doesn’t quite prepare them for ‘Symptom of the Universe‘, which wholeheartedly uses the other boot to kick in that door and chop up your furniture with one of the most iconic proto-metal riffs EVER. This, maybe even more than Master of Reality‘s ‘Children of the Grave‘ is where the metal that I grew up with came from. However, this being said, in true Sabbath fashion Symptom does not rest on these laurels but instead offers a B-side to the song’s A section, a swift and jubilant acoustic party that celebrates the joys of love and life from, yet again, a cosmic perspective. Tracks like these are why I always say anyone who was ever ‘afraid’ or critical of Sabbath for being a ‘devil-band’ are complete and total idiots who never bothered to look into the band and their message. From here I’m going to break the track order up a bit in order to better discuss the album’s centerpieces, which to me are all one big song made up of what I like to think of as the group’s own holy trinity. ‘Megalomania‘, ‘Thrill of It All‘ and album closer ‘The Writ‘ are three acts in the same play; a play where the band use Ozzy as their Shamanic Priest – a mouthpiece in what legitimately sounds like an attempt to figure out the answers to the Great and Eternal conundrum of life here on this island Earth. Years after first falling in love with this album, and its lyrics, I would read that Ozzy actually didn’t pen any of the words (that’s still never been confirmed for me, but if you listen to his solo career it makes a heck of a lot of sense). While this would-be revelation definitely affected my view of Ozzy (which subsequent decades of fame at his own expense finally laid the tombstone upon) it did nothing to zap my love of Sabbath, and especially Sabotage. ‘Megalomania‘ takes you to the depths of an introspective hell only to rise from the ashes of self at the last minute in a burst of awesome, positive hard rock energy. ‘Thrill of it All‘ continues this by asking the big questions and essentially deciding on answers that, while vague, once again show a vast intelligence and capacity for love that the group’s public image hardly ever eluded to (because of the record company, according to an interview I saw with Mr. Toni Iommi years ago). And finally ‘The Writ‘ wraps it all up with a considerably steeper contemplation of fame than most drug taking, long haired bands in the 70’s (or ever) ever attempt. Remember that by this time Sabbath were bona fide stadium rock MONSTERS and again it says something to their credibility that they were able to continue to produce their own albums (or co-produce in many cases) and craft dark, provocative and original material that dealt with the world the way they wanted to. Finally we need to add to our discussion the slightly puzzling radio single ‘Am I Going Insane?‘ and the cinematic atmosphere of ‘Supertzar‘, both left of center and exemplary examples of the band at their finest. Now as a whole we can see that Sabotage clocks in as a masterpiece of original material that transcends any genre notions that may have been imposed on it at the time of its release or since. 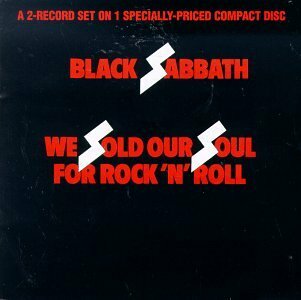 Sabbath was a powerhouse and they recorded records with genuine timelessness in mind. Now my only problem is retrieving myself from 1975 and making it back to the present. Or maybe I could swing by September 1970 and check out Paranoid first. Takashi, there any of that AG left on hand? Hmmmmm…. * Yes, I use that word a lot. Yes all of Sabbath’s albums with Ozzy are masterpieces. This one more so.